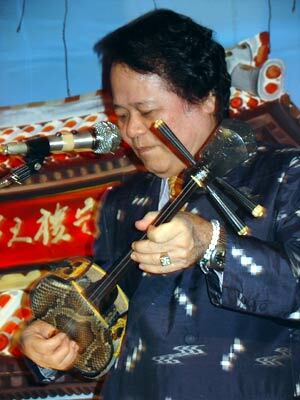 Okinawa’s unique three-string guitar, the sanshin, is the inspiration for much of the island’s pop sounds as well as its musical heritage. In its most known form, minyo, this island nation’s heritage is recounted through music and lyrics that date back centuries, when Okinawa was an independent Ryukyu Kingdom. Thousands study the sanshin, seeking to emulate their ancestors, but few attain the lofty heights of true listenability. Seikichi Uehara is ranked as one of the very best sanshin players in Okinawa, and the world, for that matter. Nearly 50 years study, practice and performing have raised him to near cult status throughout the islands of Okinawa. He first picked up the sanshin at age 15, then became proficient enough to catch the eye and ear of Miakawa Sensei, an early 1900’s music master who took Uehara under his wing and molded his talents. 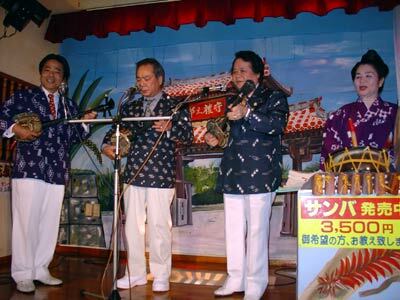 Today, as he has for years, Uehara performs Okinawa’s minyo music at NaKuNi, a music club located in Naha’s Tomari Port District. He’s had the club for 35 years, with 17 at the current location. Individuals change in his band, but the overall team remains intact. The true team leader is Uehara’s wife, Emiko. They’ve been playing together 45 years, and have been married 40 years. Like her husband, Emiko handles the sanshin and vocals with ease, and is skilled on the traditional Okinawa taiko drums and the island version of castanets. They’ve written some 200 songs through the years, and have won multiple sanshin and Asian traditional music championships. The couple raised two sons, but shake their heads puzzled as they talk about their lack of musical interest. The boys are into baseball, but haven’t picked up the sanshin. Emiko Uehara, 60, also loves to dance, and even today teaches to preserve the culture. Uehara, 64, was born in Nakajin on the northern end of the island near Nago. Uehara’s father studied sanshin and inspired him. The decades of study have paid off; Uehara has recordings through the year, and currently has four CD’s that chronicle Okinawa’s music folklore through the ages. He has 165 sanshin in his collection, including a prized instrument that dates back to the early 1600’s. Uehara calls it his favorite, but now only uses it during recording sessions. He and his wife teach sanshin and music history, working from a center near Okinawa University. They call it a labor of love, as they spend six hours with students each day before beginning a sometimes grueling seven hours at the NaKuNi club. Their followers range from junior high school students to elderly citizens. An evening with Seikichi Uehara, his wife and band, is a relaxing time to share with friends. Cover charge is ¥3,500, and allows guests to stay as long as they’d like. The club, while featuring traditional awamori and beers, has a full bar and heavy hors d’ouerves / snacks. 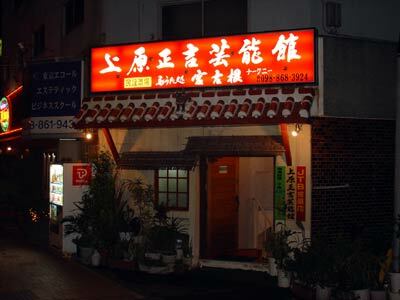 Uehara’s band performs half-hour sets each hour from 8 p.m. to 3 a.m. Karaoke fills the time between shows..
NaKuNi is very easy to find. Travel south on Highway 58 through Ameku toward Naha. While entering the Tomari District, NaKuNi is on the right side. At the main Tomari intersection make a U-turn, heading back north about 200 yards. NaKuNi is on the corner of a seven-story building anchored by Pittsburgh Restaurant (you can’t miss the large sign). Parking is around the corner. NaKuNi is in the basement.